An astutely political and compellingly chronicled life of the man the prince of Wales described as “the most extraordinary creature alive.” Sheridan, hoping to be remembered for his radical political career in Parliament, had wished to be buried in Westminster next to his Whig colleague Charles Fox; instead, the author of The School for Scandal was interred next to David Garrick, his predecessor as manager of the Drury Lane Theatre. 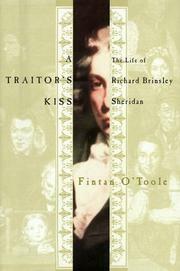 Unlike most Sheridan biographers, who tend to concentrate on the young and witty Anglo-Irish playwright and the later rake-hell drinking companion of the prince of Wales and Lord Byron, essayist and drama critic O’Toole (The Lie of the Land: Irish Identities, 1998) draws out the true character of the radical, patriotic Irishman from the public figure that Sheridan himself so carefully manipulated. Although Sheridan rose to the highest English social circles and lived in Britain his entire adult life, his cultural origins were both Protestant and Gaelic, with a literary and comic inheritance from Swift, his father’s friend. His romantic reputation, however, was entirely his own invention, beginning with his sensational elopement with the glamorous young singer Elizabeth Linley, through the two duels he fought with a rival for her and his play The Rivals, which capitalized on the incidents. Despite his phenomenal success as a playwright and his coup in taking control of Drury Lane, Sheridan, O’Toole argues, looked to literary fame only for launching his Parliamentary career. Portraying Sheridan as the most principled yet most mercurial of the Whigs, O’Toole deftly reads into the political messages hidden in The School for Scandal, the theatricality of his famous five-and-a-half-hour oration against British imperial abuses in India, and his career-long act as an outsider on the inside, consorting alike with Irish rebels and British royalty. Byron jokingly reminded Sheridan’s first biographer that “Old Sherry” was “an Irishman and clever fellow,” qualities O’Toole never understates in this superbly sympathetic life.